Crypto bulls are out and running. Even though we have seen a predictable pause at the $5,000 value area – and some understandable profit-taking – new and big volume has entered this market. With Monday and Tuesday representing the largest amount of daily volume traded in cryptocurrency history, it is not surprising that the week will close with the highest weekly volume that has ever traded. Reuters reported that, according to BCB Group, a single $100 million dollar order across the exchanges Bitstamp, Coinbase and Kraken was a primary catalyst for the price action. That amount equated to roughly 7,000 Bitcoin. Regardless of the person or persons involved in the order – or why the chose to do it on the open market instead of on an OTC market, new money entered the aggregate market. And evidence shows that volume should continue to grow. The pause at the $5,000 value area is very normal. The psychological level of $5,000 was a predictable number to see price get halted at. Additionally, the move from $3900 to $5000 should have been met with some profit taking. But this current pause is one of the most important moments that traders and investors will have seen since the all-time high back in December of 2017. It is extremely important because This the drop from the all-time high that Bitcoin has retraced enough value to test up towards an extremely important resistance level. But the price level and price action aren’t as important as the participation – specifically, the participation after a pullback. After Bitcoin reaches nearly 5-month highs by trading as high as 5345 on Coinbase, it promptly dropped to a swing low of 4778 on April 4th, 2019. But bulls came in to buy it up. 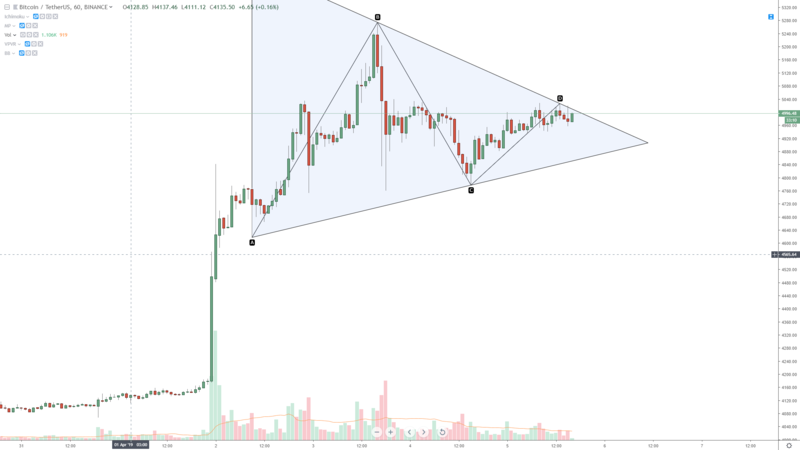 The trading today (April 5th, 2019) has shown some evidence of a bearish continuation pattern on the hourly chart – but that is only coming off of the drop from Tuesday to Wednesday. If we measure the entirety of the move from Tuesday to today, we get a very broad and contracting symmetrical triangle. This very common and powerful continuation pattern is known as a bullish pennant flag. Triangles, like bullish pennants, have particular behaviors associated with them. First, is the contraction of price – which creates the triangle. The second behavior is probably the most important and that is the volume. Typically, price will breakout of the final 1/3rd of a triangle but it will do it on declining volume. The further along the triangle price trades, we should expect to see volume taper off. And that is exactly what is happening with Bitcoin on the hourly chart. At its peak, the highest average volume was trading at 4.997k on the hourly chart. At the time of writing this article (1635), the average hourly volume has dumped down to 1.736k – a -64.72% drop. Considering that we are trading within a triangle with contracting prices, volume has had a significant drop, and price is trading well within the final 1/3rd of the triangle we have prime conditions to see a big drive outside of this current bullish pennant – and another leg up towards $6400.